It can be useful to consider complex matrix expressions as circuits, interpreting matrices as parts of a circuit and composition as the “wiring,” or flow of information. This is especially true when describing quantum computation, where graphical languages can vastly reduce the complexity of many calculations [3,9]. However, manual manipulation of graphs describing such systems quickly becomes untenable for large graphs or large numbers of graphs. To combat this issue, we are developing a tool called Quantomatic, which allows automated and semi-automated explorations of graph rewrite systems and their underlying semantics. 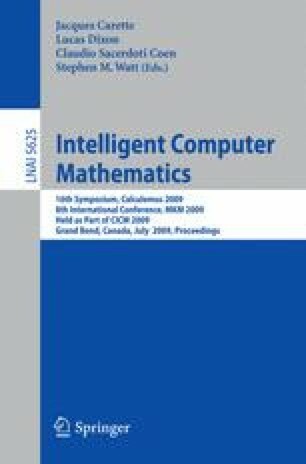 We emphasise in this paper the features of Quantomatic that interact with a computer algebra system to discover graphical relationships via the unification of matrix equations. Since these equations can grow exponentially with the size of the graph, we use this method to discover small identities and use those identities as graph rewrites to expand the theory.